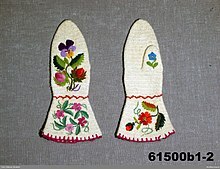 Swedish nålebinding mittens, late 19th century. Nålebinding (Danish: literally "binding with a needle" or "needle-binding", also naalbinding, nålbinding, nålbindning or naalebinding) is a fabric creation technique predating both knitting and crochet. Also known in English as "knotless netting," "knotless knitting,"  or "single needle knitting," the technique is distinct from crochet in that it involves passing the full length of the working thread through each loop, unlike crochet where the work is formed only of loops, never involving the free end. It also differs from knitting in that lengths must be pieced together during the process of nålebinding, rather than a continuous strand of yarn that can easily be pulled out. Archaeological specimens of fabric made by nålebinding can be difficult to distinguish from knitted fabric. Nålebinding is still practiced by women of the Nanti tribe, an indigenous people of the Camisea region of Peru. They use it to make bracelets. Nålebinding also remains popular in the Scandinavian countries as well as in the Balkans. The oldest known textile fragment of Nålbinding dating from c. 6500 BC was found in Nehal Hemar cave, Israel. Another made of lime bast fibre, from the Ertebølle period c. 4200 BC was found in Tybrind Vig, a Mesolithic fishing village in Denmark. The oldest known samples of single-needle knitted clothing include the color-patterned sandal socks of the Coptic Christians of Egypt (4th century CE), and hats and shawls from the Paracas and Nazca cultures in Peru, dated between 300 BC and 300 AD. Historically needles were made out of wood, antler or bone. Contemporary selections also include plastic. Nålbinding is believed to predate knitting and crochet. Historical samples have often been misidentified as knitting due to how closely they can appear in the finished products if made using the Coptic stitch. Often a textile historian will need to closely follow the path of the yarn itself to identify the item as either knitting or nålbinding. This is possible by knowing the textile structures created by the two crafts and identifying those within the fabric or by looking for a more frequent use of joining of strands. Nålbinding was used during the Viking-age of 793–1066 AD in Scandinavia before knitting and crochet were known. This was an effective method for them to use to create sturdy, serviceable garments. Nålbinding works well with short pieces of yarn. Based on this, scholars believe that the technique may be ancient, as long continuous lengths of yarn are not necessary. The term "nålebinding" was introduced in the 1970s. A famous piece of nålbinding is the 'Coppergate sock' found during an excavation of the Coppergate area of York. A clear Viking influence in the textiles was found in the finds in this area. This was a wool sock that had been created using a technique never before recorded in England. The sock was slipper-like in style and would have covered the whole foot. Nålbinding was used in some regions of Northern Europe until the 1950s, when it most likely declined because of the changes in the textile industry and almost disappeared. It later gained renewed interest among many textile historians, archaeologists, craftsmen and reenactors, so that it is today an exotic but well-kept handicraft tradition. The method creates an elastic fabric using short lengths of yarn and a single-eyed needle that is often broad and flat. The stitches are commonly, but not invariably, gauged by wrapping them around the thumb. In its simplest form, the needle is passed through a seed loop to form a new loop, taking care to avoid tightening either into a firm knot. The needle is then passed through the new loop, repeating the process until a chain of desired length has been formed. Subsequent stitches are formed in the same manner but are also joined laterally to the corresponding stitch in the chain. The extended process is similarly repeated with reference to the preceding row rather than the initial chain. Fabric is commonly worked in a single direction – "in the round" – forming spirals and tubes for socks and mittens. The work may also be turned at the end of a row for fabric "worked flat". Specialized notation is used to indicate the path of the needle as it is worked through the preexisting fabric, with its passage under a loop shown as U and over a loop as O. Examples of this are: O/UO, UO/UOO, UOO/UUOO, OO/UUO, OOO/UUUO, and OOOOOO/UUUUUUO. Stitches that can be described in this manner vary significantly in appearance, texture, and elasticity.. Wool yarn is often used because short lengths of it can easily be joined together, as the technique intrinsically requires. However, yarn made of fibers that do not felt as easily can be joined in other ways. In the construction of the 'Coppergate sock', the work began at the toe and worked in circular rows. Looping continued by the passing of the needle through the center of the first row and then brought back through the next to last loop of the current row. A heavy, thick fabric was created with great elasticity. No loose ends were visible and are thought to be joined by splicing or having been stitched into the fabric. Shaping was achieved by adding an extra loop or leaving a lower loop out of the sequence. The heel had been turned back on itself several times to create the heel shaping. Due to the "pulling through," this technique is well adapted to short lengths of yarn which can be joined together to form a textile. Nålebinding is repeatedly called more laborious and slower than knitting. This is not necessarily true, especially for the simpler stitches, such as the Oslo-, Mammen- and Brodén-stitches. Although each stitch might take slightly longer than a knitted one, nålbinding is often quicker than knitting, because each row's height (in the most common nålbinding-techniques) corresponds to 2–3 rows of knitting. It is also easier on the shoulders, back and hands, and the fabric it produces can be more dense and durable than knitted fabric. It is still used in Peru and Iran to make socks, and in parts of Scandinavia to make hats, gloves and other items that are very warm. Members of the Society for Creative Anachronism may use nålebinding to produce durable and authentic head covers for use under armor. Another common mistake is to think of nålbinding as superior to knitting, because it requires more skill. It is very easy to learn and master; given proper instruction, even the more complex techniques are quite possible to learn with comparably little prior knowledge (though some is recommended). It can create different textiles, thin and flexible ones as well as thick and comparably stiff ones, depending on which technique is used. It is equally false to say knitting is superior to nålbinding. They are different; each has advantages and disadvantages. Nålbinding does not unravel and therefore special finishing borders are not necessary. Thomenius, Erika (2006). A Beginner's Guide to Naalbinding. LCCN 2018303101. Briansdotter, Sigrid (2004). Nalbinding Made Easy. Talisman Press. Briansdotter, Sigrid. Nalbinding: The Asle Mitten Stitch. Mellgren, Nusse. Nålbindning, The Easiest, Clearest Ever Guide (in Swedish). Röstånga: Urd. ISBN 9789163329746. Kallner, Donna (2009). New Age Looping: A Handbook for Fiber Artists. White Lake, WI: Wolf Moon. OCLC 848390637. Thomenius, Erika (2009). Turning Heels: A Look at Structures in Naalbinding. Wills, Kerry (2007). The Close-Knit Circle: American Knitters Today. Greenwood Press. p. 7. ISBN 0-275-99246-2. Retrieved 2008-01-06. Rutt, Richard (2003). A History of Hand Knitting. Loveland, CO: Interweave Press. ISBN 1931499373. ^ Andersen, K. 1985, Frihavnen - den første Kongemoseboplads. Nationalmuseets Arbejdsmark, København. 1985. ^ Pearson, Michael. Michael Pearson's Traditional Knitting. William Collins Sons & Co Ltd, London. 1984. ^ a b Leslie, Catherine Amoroso. Needlework Through History. Greenwood Press, Westport CT. 2007. ^ "Bernhard's Nadelbinden Objekte". Archived from the original on 3 December 2013. Retrieved 2 December 2013.